Freshly baked waffles are the dream breakfast for many of us. Nothing can be compared to their taste and smell. They not only give a feel of a rich and royal breakfast but are incredibly easy to make and can be presented in many ways. The thick Belgian style waffles, with deep indentations for filling fruits or cream, or the crispy thin ones dripping with honey and maple syrup can be baked to the perfection with the help of a waffle maker. A waffle maker is a quick and easy way of baking fresh waffles at home. The convenience and ease of making restaurant-style waffles at home make them an essential part of kitchen home appliances. But, there are so many types of waffle makers in the market these days that one can easily get confused. There is a lot of variety in terms of material, type, shapes, and size of waffle makers. This article is a detailed overview of waffle makers. From material to size, shapes to the type, we have covered everything you need to know about waffle makers. The material used for the manufacturing of waffle makers is a very important factor that decides their durability and functionality. These are the common types of waffle makers available in the market. Non-stick wares are popular due to many reasons. They do not stick; the waffles come out easily and do not stick to the sides or bottom. They are also easy to clean and require very little or no oiling at all. However, nonstick wares are not considered very safe due to the Teflon coating. According to the Environmental Working Group, toxic fumes can be released from PTFA, a Teflon coating when heated at a very high temperature. That’s why many people have reservations about using the Teflon coating on their kitchen wares. Although these studies about Teflon coating still need more research, nobody wants to take the risk. Manufacturers are coming out with a no-Teflon coating that is nonstick and works just fine. Non-stick waffle makers are convenient. Waffles come out easily in one piece. They require less oil as the batter does not stick. Teflon coating is a big no for some people. The coating is prone to get scratched or chipped. Although easy to clean they have to be washed with hands. Even slight use of fork, knife, or any other sharp material can leave the mark and ruin your appliance. Check Out the Details about Stainless steel waffle makers. Steel Irons are durable and do not lose their shine easily. They look stylish and are a good substitute for those who do not want a Teflon coating on their waffle maker. Distributes the batter evenly for a uniform texture. Preheat time is longer than other irons. Are not very easy to clean if iron plates are not removable. Cast iron is a durable material. The surface of iron becomes nonstick if seasoned properly. Cast iron waffle makers are heavy and are excellent for heat retention. Iron takes longer to heat. You need to oil the surface regularly. Ceramic is gaining popularity due to its convenience. The finishing of ceramic iron is like nonstick ones, and they are perfectly safe to use. They work better than stainless steel as you don’t have to spray too much oil on the base. They may not be as durable as cast iron or steel ones. The next thing that matters is the type of waffle makers. There are different types of waffles, for example, Belgian waffles, thin waffles, or American style waffles. These waffles have their distinct texture, and each one has its special waffle maker. Let’s look at some of them. These are the classic ones. They have deep pockets for more filling and thick texture. They are fluffy and have a cake-like texture. Thin waffle makers are thin and crispy. They are quick to make and have a cookie-like texture. Typically made from a batter that is leavened with baking powder, American waffles have a thin and dense texture. The honeycomb squares for holding syrup, honey, or cream, are smaller and more numerous. They have smaller squares or grids, and that’s why they usually hold syrup or gravy. These are also used as a base in many recipes. They have a unique fluffy texture, batter comprises egg whites, and yeast is used for leavening. They have deep and crisp pockets that give them a unique taste. Their shape is usually rectangular. These are usually served as dessert with powdered sugar, fruit, cream, or even ice cream. Liege waffles are sweet and dense. These kinds of waffles are baked with yeast dough, and pearl sugar is added near the end to create a caramelized effect. That’s why they have their distinct sweet flavour. They have a crispy exterior that won’t get soggy with topping. In addition to making special waffles as far as texture, thickness and crispiness are concerned, there are other types of waffle makers too. Let’s take a look at some of them. Flipping irons are perfect for evenly distributing the batter. They are perfect if you want to make large waffles. They make excellent golden and crispy waffles from both sides. Due to gravity, the bottom side is more crispy and cooked well. But, in flipping iron, both sides have even texture. This is another type of waffle makers that is convenient to use. The removable plates pop out easily so that you can wash them properly. Usually making waffles is easier than cleaning the mess afterwards. The small grids are hard to clean and have too many nooks and corners to look after. Removable plates make cleaning a breeze as you just remove the plates and dump them in a dishwasher or simply put it under tap water. These irons bake waffle in shape of a deep bowl. You can fill it with a lot of fruits, creams, chocolate, gravies or even ice-cream and present them in the shape of a bowl. The bowl has a crispy exterior with a soft and rich interior. These irons are easy to store and require less space on your kitchen counter. They can be stored in vertical position. 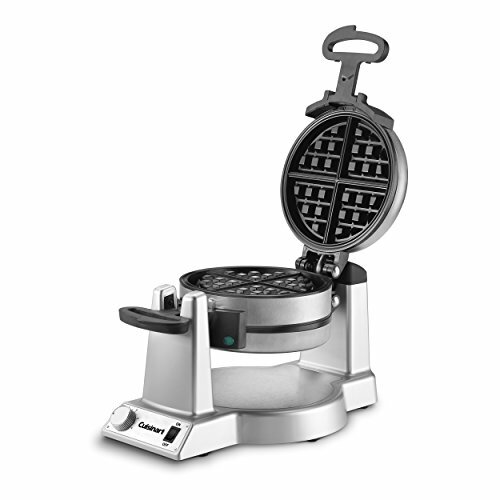 Rotating waffle makers makes perfect waffles with even distribution of batter and same color. They have a dripping plate underneath that makes the cleaning breeze. These waffle makers are perfect for making small and crisp waffles. The small waffles look unique and tempting and can be presented in many ways. Here is a quick overview of things one should consider before buying a waffle. Material: the material of waffle makers. There are some made of steel, cast iron, ceramic, or nonstick ones. Type: that depends on what type of waffles you prefer, thick and fluffy ones or thin and crispy. Removable plates: removable plates makes cleaning convenient. Temperature control: temperature control option is for those who want a professional result. The waffles are baked to perfection each time, and there is no chance of overcooking or more color than you require. Auto-shutoff: Auto-shutoff appliance is automatically turned off when the temperature is rising above a certain level. It’s a most important feature especially if you have a nonstick appliance as overheating can contaminate your food. Size and shape of waffles: Many shapes and sizes of waffle makers are available in the market. You can choose one that makes extra large waffles or goes for mini waffle maker as per your choice. Many shapes of irons are also available like round, rectangular, square, heart-shaped or some have even cartoonish shapes on them. Number of waffles: that also depends on your need and preferences. Some waffle makers make one large waffle of any shape at a time, while others prepare double or multiple waffles at a time. So, it depends on the size of the family or if you are planning to use it for commercial purpose. Dripping Tray: Dripping tray prevents mess as it catches splashes and drips of batter and keeps your counter clean. You don’t have to clean the mess on counter, and usually, dripping trays are also removable and dishwasher safe. Budget: Surely, you should buy one that doesn’t put any restraint on your budget. Bells and whistles: As technology is advancing, the manufacturers are adding the latest features to the appliances. You can make use of them surely if you can afford them, but if you have a limited budget, then we certainly advise to stick to the basic one that serves the purpose. Heart shaped waffles: the perfectly small heart-shaped waffles are a treat to the eye. They can be presented with different toppings and are excellent for occasions like parties, valentine day or other celebrations. Cartoon characters and emoji’s: Many cartoon shaped waffle makers are available in the market, for example, Micky/Mini mouse, or different emoji’s. Round/square/ Rectangle shapes: Different sizes of waffle makers can be baked in these simple shapes, and one can make use of them in different interesting presentations. Shield shapes waffles: An interesting shape is Captian America’s shield. These shapes are perfect for celebrating national days. Many other shapes are available like animals, snowflakes, small bars, stars, flowers, and many more. You need to do a quick research of the market and choose the one that catches your fancy. You can collect different shapes of waffle makers for making many presentations in parties, breakfasts, and other occasions. 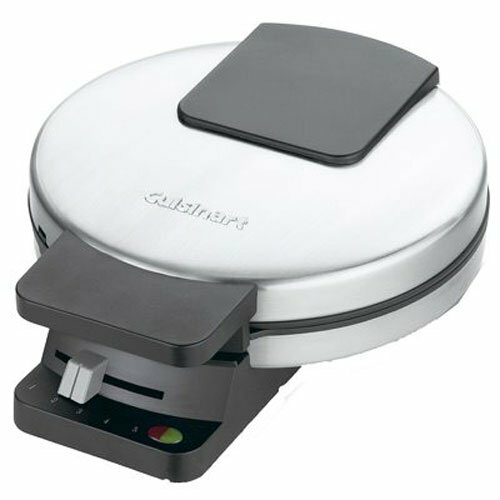 Panini press and waffle maker: some of the waffle makers are multi-functional and can be used as a Panini press, open grill and griddle. A grilled sandwich is a great way to start your day, and you can add a lot more things into it to make it healthy as required by your diet plan. Omelets: you can make an easy and quick omelet with the help of waffle maker. Make use of your grilling tray, or you can make waffle style omelet too. Bread and pizzas: you can use the iron of waffle maker for baking small bread and pizzas. These take little time to prepare and with a little practice turns out excellent results. Brownies: Just pour your favorite brownie batter on the waffle iron and let it bake for a while. You can adjust the temperature to make it chewy, crispy, or fluffy as you prefer. Cookies: you can bake simple cookies or chocolate chip cookies easily and quickly. These are just a few examples: you can be as much creative as you like and make use of your waffle maker for baking many other things. Having said all that now comes the part where we are going to recommend some of the best waffle makers in the market. 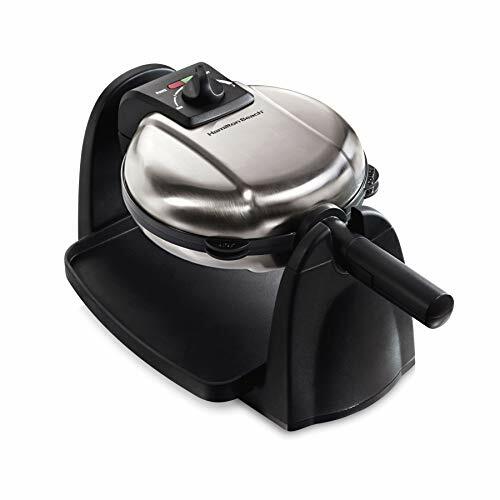 Below are the waffle makers from various categories presented above that are the best in comparison with the price. Most of the waffle makers are under 50$ but if you are on a tight budget you have even an option under 20$. 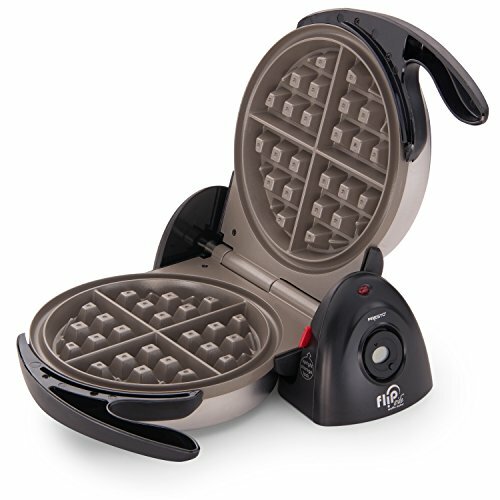 This waffle maker by Oster is a Belgian waffle maker. It means that it bakes thick and fluffy waffles that have deep pockets for holding plenty of topping, cream, and gravy. The waffle maker features an 8-inch nonstick plate that releases the waffles easily without sticking to the corners and is easy to clean. The iron has adjustable temperature control, and you can customize the heat according to your preference for excellent results. Its stainless steel housing adds durability and gives it a neat and shiny look. The waffle maker has a stay cool handle that gives a comfortable and firm grip. Makes thick and fluffy waffles. Deep pockets for holding more filling. The nonstick plate is easy to clean. The plate is not removable. This one is a ceramic waffle maker for those who do not want a Teflon coating on their kitchen wares. The waffle maker bakes Belgian waffle maker that is extra thick, fluffy and have a cake like soft texture. The deep indentations make thick pockets for rich fillings. The baking plate has a 7-inches diameter and is divided into four easy-to-cut sections for making four waffles. Its dual function base assures convenient rotations for baking. It’s a flipside waffle maker that flips to 180 degrees to evenly spread batter for waffles that are crispy from outside and tender and soft from inside. The waffle maker has a timer and digital display that signals when the time is complete. Rotating function can make storage easy as you can store it in a vertical position that covers less space. Its nonstick interior is easy to clean. Timer and a digital display. Though indicates when the time is complete but doesn’t stop automatically. 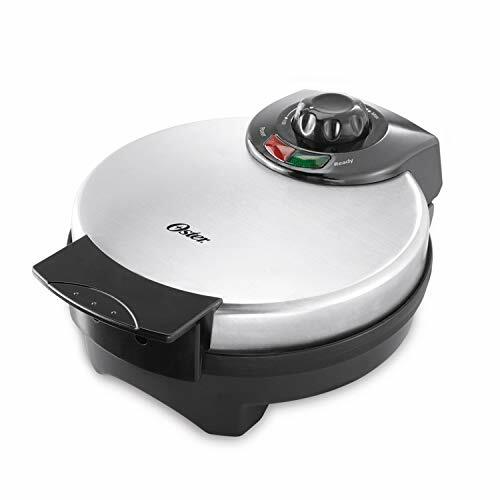 This one by Cuisinart bakes classic style waffles. The round baking plate has four quarters. The five brown control option lets you set your required temperature depending on your batter and recipe. The non-stick baking plate is easy to clean and requires no oiling at all. The waffle maker has dual light for ‘ready to bake’ and ‘ready to eat’ indicators. The appliance stands on the end for compact storage. It comes with three years warranty. This one is also by Cuisinart. The stainless steel exterior looks elegant and can easily blend into any kitchen décor. The waffle maker creates two 1-inch thick waffles with deep pockets. With six temperature control options, you got a lot of variety for baking different batters with perfect results. Its non-stick baking tray is convenient to clean and releases the waffles easily. The light indicators signal when the baking plate is heated or waffles are ready. The flip style waffle maker evenly distributes the batter on baking plate. Does not have vertical storage and takes more space. This waffle maker has all that you want in a waffle maker. It’s a flip waffle maker that makes perfect shaped belgian waffles with a smooth texture. Flipping action makes crispy from outside and soft from inside waffles. The waffle maker has removable plates that make cleaning a breeze. It has a non-stick baking plate that is easy to clean and requires no scraping at all. Adjustable brown control can bake waffles as you prefer. The stainless steel design has a modern look and easy to wipe with a cloth. A dripping tray keeps your counter clean, and both the dripping tray and baking plates are dishwasher safe. Available in copper and black colours. Covers more space on the counter. This waffle maker has a double cooking plate. Two sets of double cooking plates let you bake two delicious waffles at the same time. Its rotating system helps in distributing the batter evenly and also it makes sure both sides waffles have the same texture and colour. It’s a Belgian style waffle maker and bakes thick and fluffy waffles with deep pockets for your favourite toppings. The non-stick surface of baking plates is easy to clean. Non-stick surface also reduces the need for extra seasoning. To avoid the messy counter, the waffle maker comes with a dripping tray. No messy counters after baking. 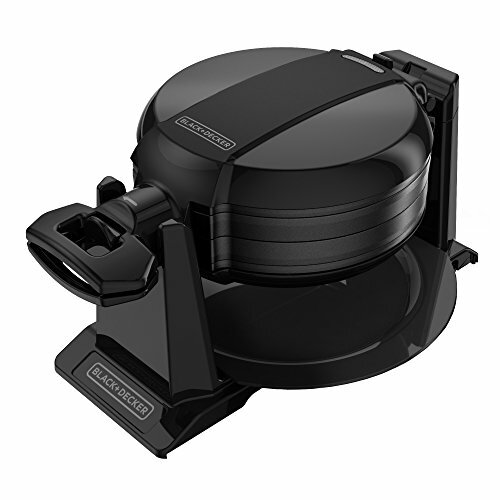 Overall, the waffle maker looks elegant with its shiny black look and adds the beauty of your kitchen’s interior. Rotating function for even distribution of batter. Bakes thick and fluffy belgian waffles. Baking plates and dripping tray are not removable.